W h a t z Co m i n g U p …… ? WHATZ HOT AND WHATZ NOT..........!!!! CHRISTMAS the festival of Love, Peace, Hope and Joy for people of every walk of life is the happiest time of the year, and with your co-operation and generosity we intend to have a wonderful Christmas this year too. The festivities will begin with the sale of Hamper Tickets. Members are to sell their Hamper Sheet/s amongst family, friends & well wishers and return the same with the money to the Honorary Secretary latest by the 16/12/18. THE LEIGHLYN FERNANDEZ MEMORIAL CHRISTMAS CAROL COMPETITION 2018 will be held on Sunday 16th December 2018 at Don Bosco Academy, Digha Ghat starting at 10:00 am. The Annual Christmas Tree Party will be held on the 21st of December 2018 at building # 137 – Patliputra Colony starting at 5 pm. Children up-to the age of 12 years will be given gifts from the branch. Aunty Dorothy’s Christmas cake, great games, good music, Santa and the Great Hamper Draws await you at this party. Be there !!!!! Please confirm your participation for these events by the 16th of December 2018 to the Honorary Secretary. To make the Christmas Festivities successful we need all the funds possible too. Therefore, to avoid any embarrassment, members are requested to clear their subscriptions up-to December 2018 and collect the entry passes. Please pay your subscriptions vide cheque drawn in favour of Anglo-Indian Association, Danapur Branch. Having said that, I’d like to inform you that member’s whose spouse or child (who has completed high school) and is not a member of the Danapur Branch but would like to attend these functions will be permitted to attend on payment of Rs. 500/- per head per function. Outstation guests @ 300/- per head per function. A BIG THANK YOU to all our members who have been very co-operative whenever the need arose and we look forward to your presence and co-operation at these events too in True Christmas Spirit. Please DOWNLOAD THE FORM BELOW AND fill in the details and return it to Honorary Secretary by the 16th of December 2018. 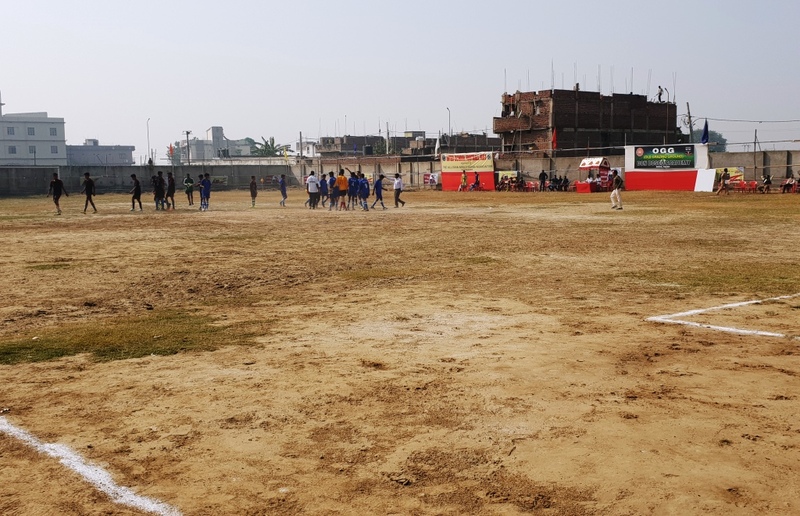 The HERO CUP - 5th Inter-School Football Fest that was to be held on 24th & 25th November 2018 at Don Bosco Academy, Digha Ghat main Grounds. Please come and attend this gala tournament. It is impossible to thank a teacher. There are no words to appreciate someone whose words empower children to chase their dreams. But our young ones of the Danapur Branch are going out of their way to say a THANK YOU to the wonderful teachers of our branch by putting up a small show for them on Saturday, September 8 th 2018 at the DBA Hall, Digha Ghat starting at 5:30 pm. Invitation cards prepared by the children are being sent to members to attend this function which will be hosted and presented by them. All members are requested to attend this get together and encourage the efforts of our children. As they are making arrangements for dinner, you are requested to confirm your attendance immediately on the reverse of this notice or call the undersigned. As we have a long weekend coming up, the branch has organized pot luck and housie on Sunday 2 nd September 2018 at building # 126 PPC starting at 6:00 pm. A special prize awaits the best preparation of the night……so let’s get cooking. Soft drinks on the house. 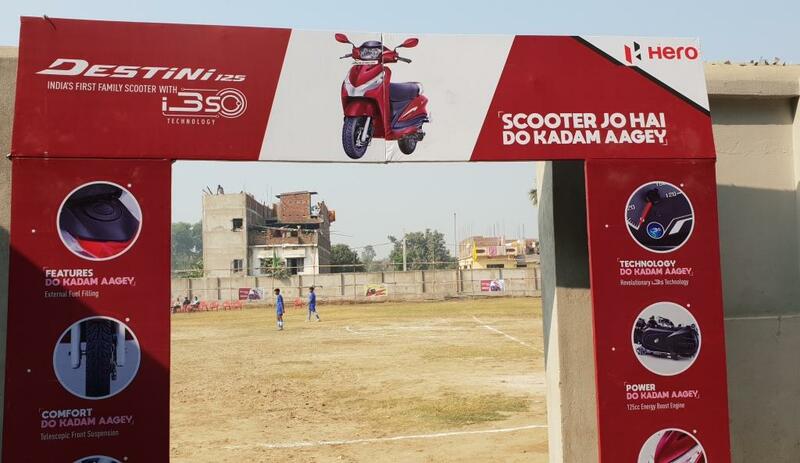 Please be informed that the Danapur Branch AGM will be held on Saturday 25th August 2018 at the Don Bosco Academy premises at 126 – Patliputra Colony, starting at 6:30 pm. 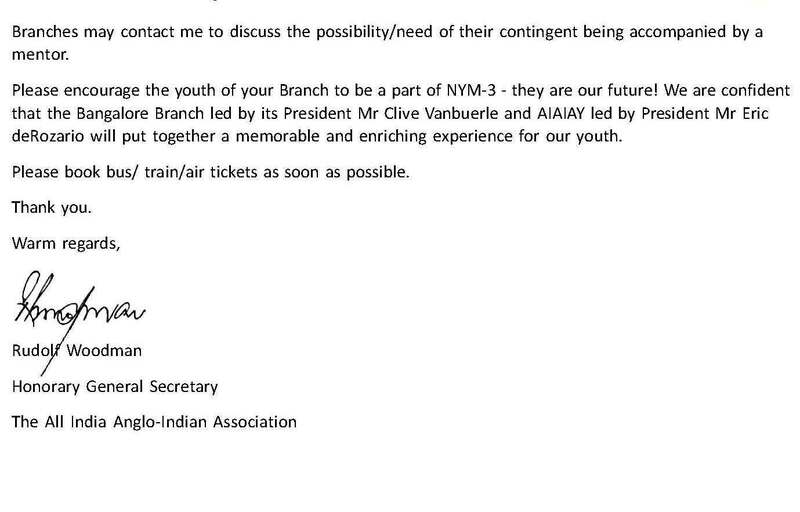 All members are requested to attend, especially the youth of our branch. 3 To confirm and pass the minutes of the last AGM ’17. 4 Honorary Secretary’s Report for the year 2017 - 18. 5 To present and pass the accounts for the year 2017 - 18. 7 Election and Introduction of New Office Bearers. The AGM will be followed by awarding our students for their perseverance in academics followed by social and dinner. You are requested to give in the name/s of your children to the undersigned by 23/08/18. Youth of the branch who have cleared their 10th Std. are requested to fill in the Membership Application Form and join the branch as student members and the Youth Committee. All Members are requested to attend the AGM. Members PLEASE clear your dues up-to December 2018 as the same needs to be sent to the Head Office. Since we are providing dinner, we would like to know the number of members attending the AGM so that we do not under cater or over cater. Please confirm your attendance on the reverse of this notice immediately or call the undersigned. on Saturday, 20 October 2018, commencing at 9.30 a.m. The inauguration and the National Awards ceremony will be held on Thursday, 18 October 2018, commencing at 7.30pm. 1. To confirm the Minutes of the Annual General Meeting held at Visakhapatnam, on Saturday, 30 September, Sunday, 1 October and Monday,2 October 2017. 2. To consider matters arising out of the Minutes. 3. To consider and adopt the Annual Report for 2017-18. 4. To consider and pass the Income and Expenditure Account, Balance Sheet and Auditors' Report for the year ended 31 March 2018.
including Noida and Gurgaon [Article 44 (iii)]. 7. The President-in-Chief to nominate not more than three members to the Governing Body. [Article 44(v)]. 8. To consider Special Business i.e. amendments to the Articles of Association given by the Governing Body or a Branch Committee for which the required twenty-eight days' notice has been duly given. 9. To consider Resolutions from the President-in-Chief, the Governing Body, and the Branch Committees. 10. To appoint Auditors for the Association for the year ending 31 March 2018. 11. To consider Any Other Business with the permission of the Chair. (i) Only members of three months' standing and above and whose subscriptions have been paid up to 31 August 2018, shall he entitled to attend the meetings and entitled to vote or appoint proxies to vote instead of themselves. (ii) No person shall be eligible for election to the office of a member of the Governing Body at the Annual General Meeting unless he/ she has, at least 7 clear days before the meeting, delivered at the office of the Association a notice in writing duly signed signifying his/her candidature for the office and is duly proposed and seconded by members of the Association (Article 52). --Branch membership total will be taken as per Rolls submitted to Head Office as on 31 January 2018. -- Copies of train tickets must be submitted for reimbursement (for audit purposes). Please note that it will not be possible to reimburse in the absence of the copy of the train ticket. -- Only the first 220 outstation Delegates to register for dormitory accommodation can be accommodated. -- Only Branches that havecleared their Head Office dues up to 31 July 2018 will be eligible for reimbursement of the Delegates train fare, and board and lodging for its eligible delegate/s. Important: This will be strictly adhered to by the Head Office. If you prefer this option, you will need to fill in one form for every individual delegate. or email a scanned copy of the receipt / bank transaction advice. -- Please note that you will need to upload an image of the bank receipt or online confirmation of payment. -- Email confirmation of registered delegates will be sent by HO once the payment has been made. -- Arrangements will only be made for delegates from those Branches that complete registration and remit the amount to the HO account by 10 September 2018. -- Please arrive at the Bishop’s School Camp on 17 October evening or 18 October by 6 pm (The Bishop’s School, 5A General Bhagat Marg, Camp, Pune – 411001). -- Dormitory Accommodation arrangements made by organisers will be on first-come-first- served basis. Only the first 220 delegates can be accommodated in the Bishop’s School dormitories. All other delegates will have to make their own arrangements. -- For all meals, Food and Beverage Coupons will be issued to each delegate. -- Dormitory accommodation will be at two venues – Bishop’s School Camp and Bishop’s School Kalyani Nagar. In case of very large delegations from Branches, it may be possible that all delegates may not be accommodated on the same campus. This is to inform you that the Danapur Branch AGM ‘2018 and the World Anglo-Indian Day Celebrations scheduled for tomorrow (Saturday 4th August 2018) has been postponed due to unavoidable circumstances. A fresh date for the same will be announced and emailed to you at the earliest. 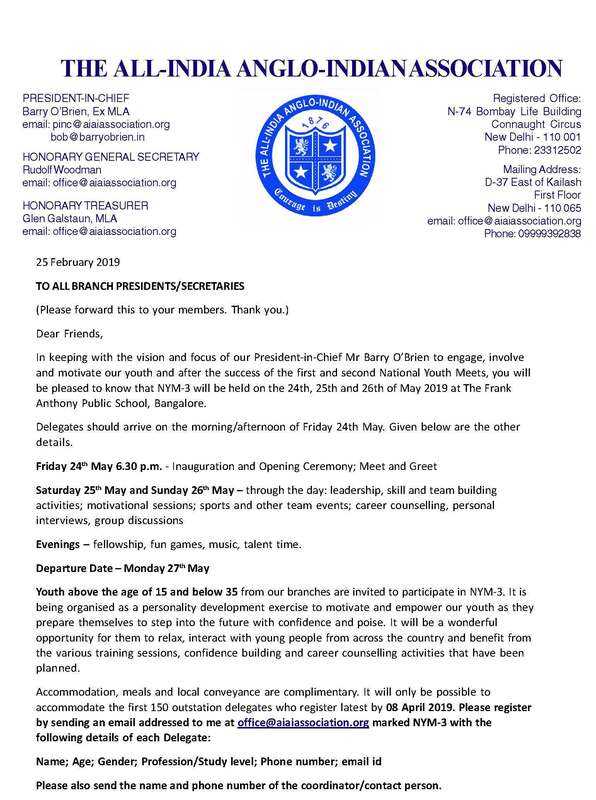 Please make note of the following dates and events. 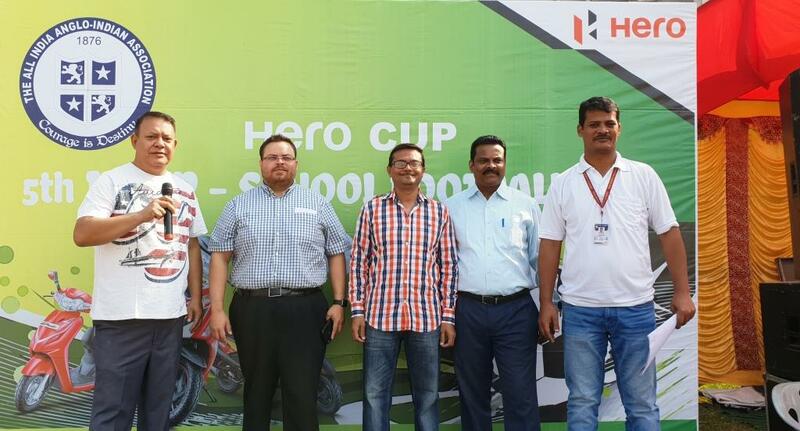 1 The HERO CUP - 5 th Inter-School Football Fest will be held on Saturday 28 th July and Sunday 29 th July 2018 at the Don Bosco Academy Grounds at 08:00 am. 2 World Anglo-Indian Day Celebration and the Danapur Branch AGM at the Don Bosco Academy Hall on Saturday 4 th August 2018. The World Anglo-Indian Day celebration will commence with a Thanksgiving Mass at 05:30 pm followed by our branch AGM. 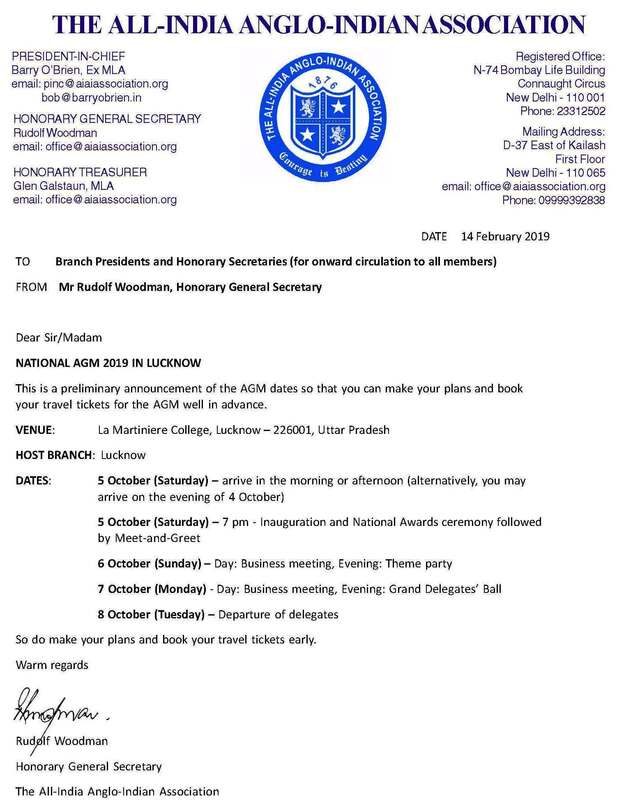 The AGM will be followed by the World Anglo-Indian Day Celebration wherein students of the branch will be rewarded for their perseverance in academics followed by social and dinner. You are requested to give the name/s of your children to the undersigned by 31/07/18. Youth of the branch who have cleared their 10 th Std. are requested to fill in the Membership Application Form and join the branch as student members. 6 Other Matters : Delegates to the National AGM at Pune. up-to December 2018 as the same needs to be sent to the Head Office. It’s been exactly three months since we last met. The last being the Boxing Day Party along-with members of the Patna Branch at DBA hall and it sure was a wonderful evening in true Christmas Spirit. And taking that spirit forward both the branches will celebrate Easter together beginning with a very a charitable and noble act – Blood Donation. A Blood Donation Camp will be held on Good Friday at Holy Family Hospital from 08:00 am to 11:00 am. Members who can donate blood are requested to donate their precious blood for the needy. Please encourage your friends to donate too. Donating blood is not only a noble deed, its healthy for the body. An Easter Party will be held on Easter Sunday at the Don Bosco Academy Hall starting at 07:00 pm. Please confirm your attendance immediately for catering purpose. Please give the names of children ( 12 years and below ) as the branches will be giving them an Easter Egg each. Members are requested to confirm their attendance on the reverse of this notice/call/whatsapp to the undersigned immediately. Looking forward to seeing you all at both these events.